Easy scanning in high resolution at an affordable price? The result of this all is the EinScan-Pro+. This multifunctional 3D scanner is easy to use and offers you high qualitative 3D scans. Sold with the software SolidEdge, a powerful tool to edit your 3D scans. 5 880,00 € 5 880,00 € tax excl. EinScan-Pro+ is a multifunctional handheld 3D scanner that rapidly captures the 3D data of the real objects to the computer, including human body as well as complex and irregular shapes and figures. The EinScan-Pro+ is very user friendly, as well is the software. The EinScan-Pro+ is equipped with texture scan function, capable of capturing the full color 3D data of the object. The EinScan-Pro+ has not less than 4 scan options available. The handheld rapid scan and the handheld HD-scan are available for scanning freely. 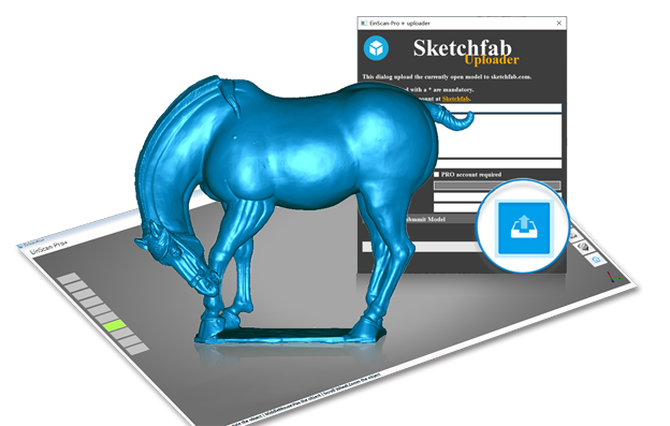 With the automatic scan and the free scan Shining3D offers 2 options to scan on a Tripod. These last two are comparable to the EinScan-S. The EinScan Pro Color Pack is an addition that you can purchase with your EinScan-Pro+ 3D Scanner. Thanks to this little addition you can scan different textures and colors with the same scan. The EinScan Pro Industrial Pack consists of the tripod and turntable. In combination with your EinScan-Pro+ 3D scanner, you can make the most detailed and complex scans that you can imagine.